Curious visitors who turn left off the Harvard Art Museums’ elevators on the building’s fourth floor are greeted by the Forbes Pigment Collection, a floor-to-ceiling wall of color compiled from about 1910 to 1944 by the former director of the Fogg Museum. As brilliant as any of the works in the Harvard Art Museums’ galleries is a rainbow of small glass jars on the building’s fourth floor. Curious visitors who turn left exiting the museums’ elevators will see the Forbes Pigment Collection, a floor-to-ceiling wall of color compiled between about 1910 and 1944 by the director of the Fogg Art Museum. Edward Forbes’ fascination with a painting’s colors and their binding medium — a close inspection of which could help to determine a work’s authenticity — fueled his desire to use science to understand and study great works of art. He is often cited as the father of the field of art conservation in the United States. By the 1920s, Forbes had amassed containers of deep blues, rich purples, vibrant yellows, and myriad other colors from his travels to Europe and the Far East. Through the years, word of mouth helped the collection to grow as other art lovers and experts donated their own pigments. The museums’ collection, which is continually added to, now contains more than 2,500 samples and is renowned in the art community. For years, the pigments have helped art experts to research and authenticate paintings. Samples from the collection have been sent to the J. Paul Getty Museum, the Library of Congress, the Asian Art Museum of San Francisco, and the National Research Laboratory for Conservation of New Delhi, India. In Cambridge, Forbes’ legacy thrives in the museums’ Straus Center for Conservation and Technical Studies, where experts preserve masterworks for future generations and decipher the chemical makeup of paint and pottery glaze. In addition to being their own artworks, Forbes’ pigments are a window to the past, shedding light on the working methods and preferred materials of renowned artists. Studying the pigments also reveals the effort it took, in the days before synthetic pigments, to get colors just right. 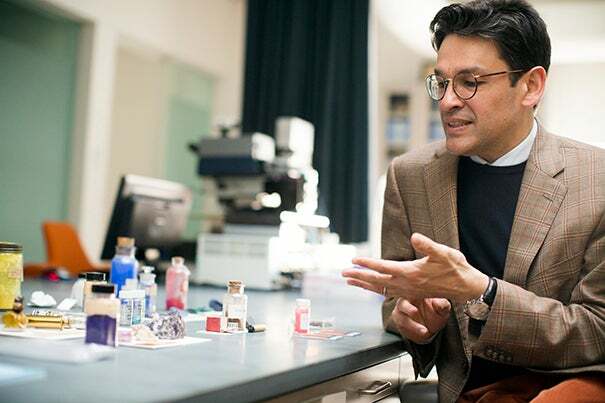 Director of the Straus Center for Conservation and Technical Studies Narayan Khandekar explains how the creation of a synthetic substance, which was chemically identical to the pigment produced from the semiprecious stone lapis lazuli, opened up a new world of blue hues to artists. Khandekar explains the aquatic origins of Tyrian purple. The use of tiny metallic flakes suspended in a binding medium can give artworks a shining finish. The rich kermes red pigment was created by grinding up the dried bodies of insects that lived on the kermes oak tree. Some pigments must be handled with care, including the yellow-hued orpiment and the red-orange realgar, which are derived from arsenic sulfide minerals. Artists often took risks to create their works, using poisonous pigments like emerald green to get the color just right. Khandekar discusses the use of cadmium yellow by the Impressionists. In recent years, working with the collection helped experts to develop an innovative “virtual” restoration. After analyzing Lithol red, the pigment favored by abstract artist Mark Rothko, Khandekar and a team of scholars developed a technique that used light from a projector to augment the faded colors on a series of Rothko murals that the artist painted for Harvard. “It’s wonderful when a call comes out of the blue for something that’s just perfect,” said Schlesinger Library’s curator of manuscripts, Kathryn Jacob (photo 1), who coordinated a new acquisition — six silkscreen prints by Corita Kent, a pop artist fond of blending the sacred with the secular, and the subject of a new exhibit at the Harvard Art Museums.